Celebrate Your Face Fuzz this Movember!! – DIY Moisturing Beard Oil and Moustache Wax Recipes - Amphora Aromatics Ltd – Supplier of pure essential oils and aromatherapy Products. as we head into the winter months? If so, Amphora Aromatics has the answer - a nourishing DIY Beard Oil and Moustache wax. 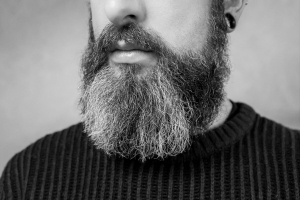 As well as leaving you smelling heavenly and your facial hair feeling soft, beard oils and moustache waxes are intensely moisturising and can help protect your skin too. • A carrier oil of your choice or a blend. I have chosen a 3:1 ratio of avocado oil to rosehip seed oil. Carefully mix the contents and decant into your container. Give it a good shake and you are ready to go. How to use: Apply after showering/washing when the skin is warm, the pores are open and the beard is still damp -this will help to retain more moisture. Use 3-5 drops of the oil (a little goes a long way), rubbing into the hands before applying to the face. Cover the whole beard and massage deeply into the skin underneath. • 100ml of your preferred carrier oil - Coconut, Jojoba, Argan, Sweet Almond etc. Place the wax in a bowl and suspend over a pan of simmering water (or use a double boiler). Gently stir and melt the wax and then add the carrier oil. Once melted, take off the heat and then add your pre-mixed blend of essential oils, stirring all the while. You have to move quickly as the wax begins to harden. Once fully blended, decant into your containers and allow to set. This should take between 1 and 2 hours. How to use: Take a small amount of wax in your fingers, rub them together before applying to your moustache. Cover evenly first thing in the morning and throughout the day for a silky stylish finish. Tips: It’s important to try and find the right oil for your skin. Different oils can be blended together to create a beard oil that suits. If you find your skin feels itchy or irritated once you’ve applied the oil or wax rinse thoroughly with cold water. It is important to always carry out a patch test before using any natural ingredients you haven’t used before. Just apply a small amount of the blend to the inside on your elbow and keep an eye on the area over the next 24 hours. If you have blended a few essential oils together you may need to test each one individually to find out which is causing your skin to react. And there you have it, two gorgeous everyday treatments for face fuzz that deserves a little TLC. If you have a lot of beautiful hairy people in your life, why not make a batch as Christmas presents and decorate the jars/tins.